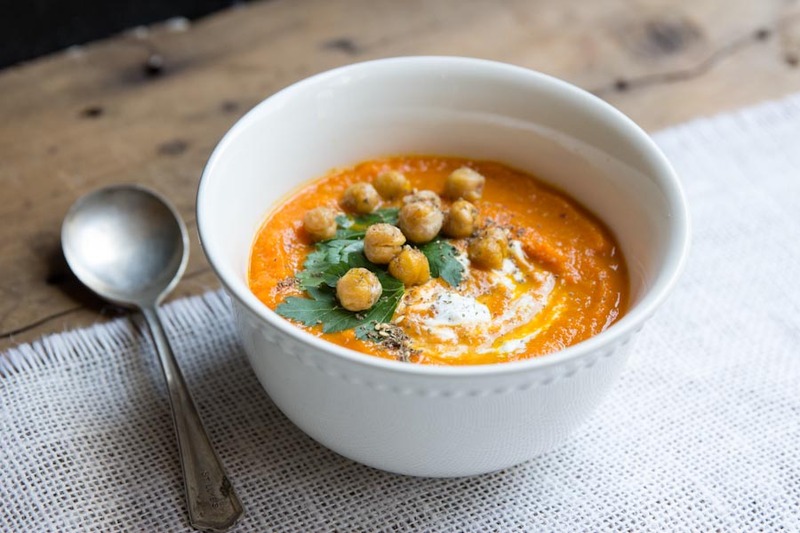 Josh and I both love soups, especially creamy comforting soups like this Carrot Soup, and the more toppings the better! All winter long we’re pureeing our favorite vegetables to make creamy-creamless soups… all you need for this is a good blender or immersion blender. It’s actually super easy to turn carrots, garlic, onions, with a few spices and vegetable broth into a thick creamy soup! 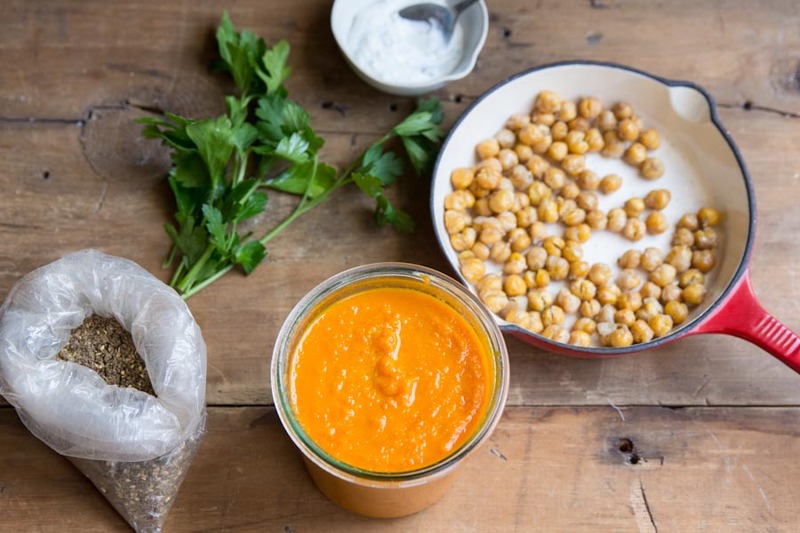 Then once you have the base, pick out a handful of toppings to add more substance to the soup… our favorite is roasted chickpeas and greek yogurt. You can also use this soup recipe and just switch up the vegetable – try broccoli, parsnips, potatoes, or cauliflower. Besides eating soup this winter, Josh and I have been soaking in every new change Everett is experiencing. He began crawling backwards about a month or so ago, which meant that he would get himself stuck in corners or underneath tables and chairs quite often. Frustrating as that was, it was also kind of cute to find him under the crib smiling. For his sake, we’re glad he’s crawling forward now, and even pulling himself up on things. He’s strong and I’m sure will be standing and walking in no time. Everett also loves to crawl to where ever Henry is and pull his tail or pet him. And when he’s eating he always shares a few bites with Henry, handing him a cheerio or letting him lick his fingers. The winter and warm soups have been nice but we’re ready for spring, more trips to the park, and playing outside! 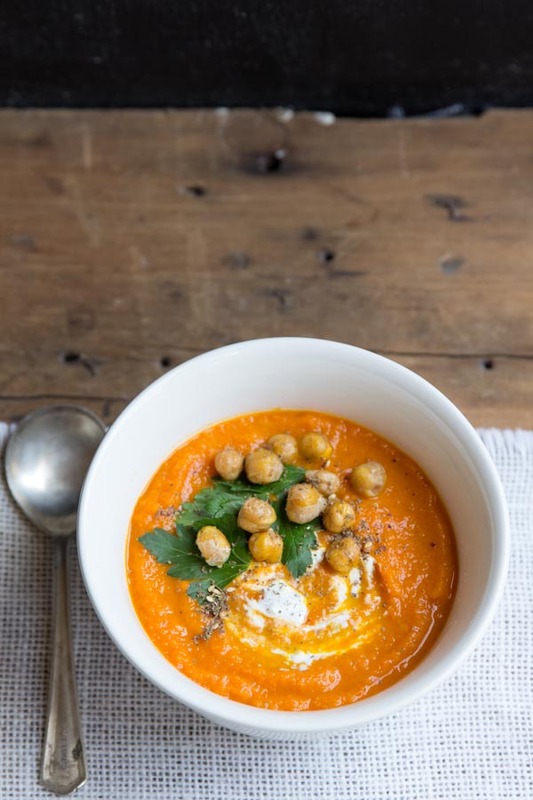 Creamy but cream-less carrot soup topped with roasted chickpeas and greek yogurt. Puree soup in a blender or with an immersion blender until smooth. Ladle into bowls. Dollop each with greek yogurt, roasted chickpeas and za'ahtar. 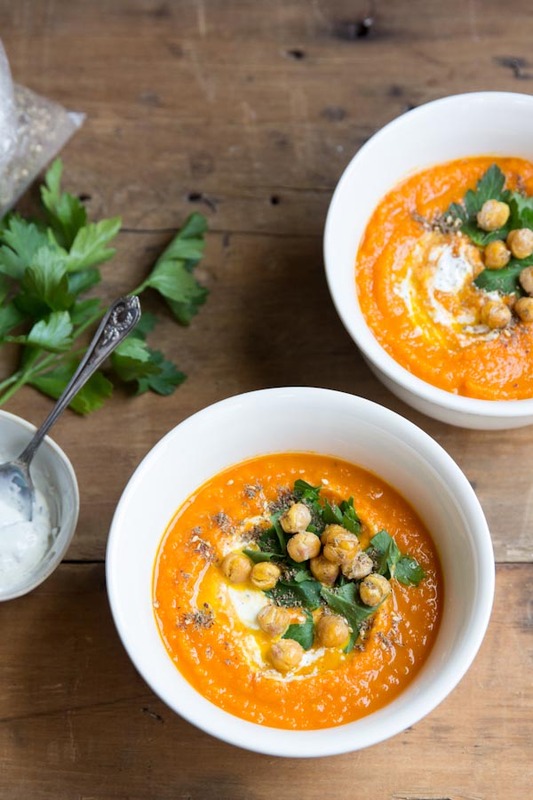 *you can also just use plain greek yogurt but we like to spice ours up to serve with soups. We usually add whatever herbs we have on hand - parsley, mint, cilantro, dill and a big squeeze of lemon juice. For this soup the greek yogurt is good with lemon juice and chopped parsley. I love making carrot soup but normally use herbs like thyme instead, but I can image cumin and coriander go perfectly with the soup! Also loving the addition of chickpeas! Yum! Greek Yogurt in hot soup has been an obsession of mine lately. Me too!! Can’t get enough of it! We use it instead of sour cream a lot. I love the chickpea crispy crouton idea! Lovely idea Adrienne! Do you have a favorite recipe for cashew cream? I’d love to try it! I’m definitely making this. Thank you! I made this over the weekend with cauliflower instead of carrots, and it is great! I’m going to eat it for lunches this coming week. MMM… I love a good cauliflower soup too! Trying that next time. Thanks for the idea Julia! Hi, Pinterest brought me here with this carrot soup. 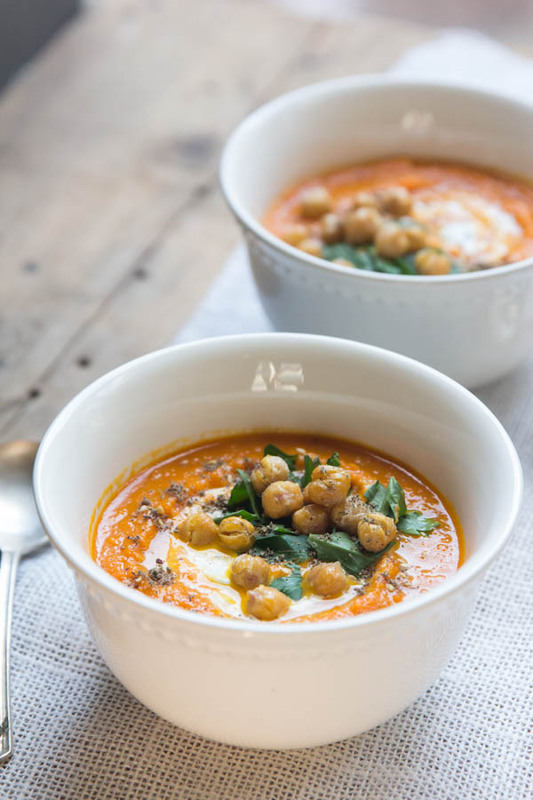 We also are great fans of soups, even in the summer, and this one with the roasted chickpeas is very tempting. I will make it very soon to warm us as it is still very cold in Quebec! Thank you, your blog is very interesting. Oh.my.goodness. I just ate a bowl of this and I can’t stop thinking about how good it is! Seriously, it should be illegal. Thank you so much for this recipe. It’s definitely going to be a staple in my kitchen! Chelsea, thanks for sharing! I’m so glad you’re enjoying it. Pinned and I will be sharing this yumminess on Katherines Corner on Tuesday . Hugs! This soup is DELICIOUS! Next time I plan to double the recipe and freeze some of it for lunches. Added fresh parsley and a dollop of Greek yoghurt. Sounds perfect and I’ve frozen it before and it keeps great flavor. Enjoy! You say two lbs of carrots…chopped? shredded? Thanks for asking – I should have put that in the recipe! You can just slice them into 1/2-1 inch thick rounds. Enjoy! My whole family loves soups year round. Esp. my daughter an I. I was looking for one for her first ‘I made it myself’ recipe, and this is it! It sounds yummy and I love all the ides posted for versatility! Thank you all and I am sure my dd will be happy! Aly, that’s so sweet!! Please let me know how it turns out and any adjustments you make. Enjoy!! Oh my word this looks good!!! Thank you for the recipe!